The first cohort of students to participate in the Advanced Manufacturing Technology program have begun training. 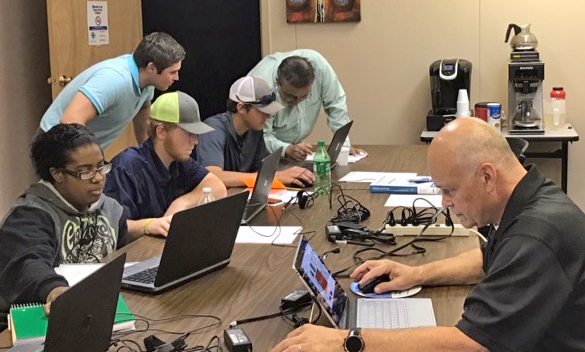 From left are students Melonia McDaniel, Ben Gewin, Brinnen Gordy and Ethan Howell with Dr. Nabin Sapkota, a professor of engineering technology at Northwestern State University, and Randy Caskey, AMT program instructor. The students are employed at four different manufacturing facilities in the Cenla region. NATCHITOCHES – Manufacturers in the Cenla region have partnered with Northwestern State University, Central Louisiana Community Technical College and Northwest Louisiana Technical College in offering a groundbreaking hands-on learning program that allows students to take classes and work part-time in sponsoring manufacturing facilities. A cohort of four students began the Advanced Manufacturing Technician (ATM) program this fall, which allows the student to earn an associate degree from Northwestern State with additional coursework offered through CLTCC or NWLTC-Natchitoches. Students then have the option to continue on to earn a bachelor’s degree in engineering technology at NSU. Program participants must meet eligibility requirements. Caskey, who comes from the industry side, said there are an estimated 2,000 jobs in central Louisiana that need to be filled. The program is supported by the Natchitoches Community Alliance Foundation and is made possible through agreements with five sponsoring manufacturers, Alliance Compressors, RoyOMartin, Pilgrims, Boise Cascade and Stella-Jones. Caskey said students gain not only work skills, but also soft skills in written and verbal communication, dress code and interacting with management. “They will have to write and give presentations, just as they would on the job,” he said. For more information on the AMT program, contact Dr. Ali Ahmad, head of NSU’s Department of Engineering Technology, at ahmada@nsula.edu or (318) 357-6751; Laurie Morrow, dean of the NLTC-Natchitoches Campus, at lauriemorrow@nwltc.edu or (318) 357-2443, or Mike Wolff, director of the Manufacturing Extension Partnership of Louisiana at mike.wolff@mepol.org or (318) 581-3594.